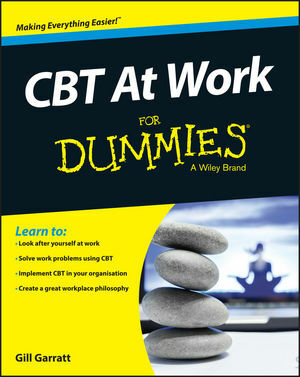 Packed with useful tips that make it easy to incorporate CBT—Cognitive Behavioral Therapy— into your working day, CBT at Work For Dummies helps you reap the benefits of a more focused working life. You'll discover how integrating CBT at work promotes improved productivity and concentration, lower staff turnover, enhanced employer/employee and client relationships, reduced cost of staff absenteeism caused by illness, injury, stress, and more. An alarming number of individuals in the UK and across the globe suffer from work-related stress, some to the point of experiencing illness. The good news is, Cognitive Behavioural Therapy—often associated with treating acute mental health conditions—is finding its way into the workplace, where it's being used as a way to combat one of the most common occupational health issues: stress. In this friendly and accessible guide, you'll find everything you need to put CBT into practice today, whether you're in charge of managing employee wellness or just want to find a positive and productive way to get through the workday yourself. If you're an employer looking to get the best out of your staff or an employee interested in reducing stress and anxiety whilst achieving an enhanced performance at work, CBT at Work For Dummies can help. Gill Garratt, M.A. Psychol., M.A. Prof. Writing, B.Ed. Hons, Senior Accred. REBT Therapist is an accredited psychotherapist in the U.K. who specialises in using Cognitive Behavioural Therapy in the workplace. She has 30 years experience in the public and private sectors both in the U.K. and internationally. Gill has incorporated CBT into individual and group training in a wide variety of workplace settings.